Stella Arnaldo's Blogspot: Move those relief goods Sec. Cabral! Anyhoo, this is disturbing news indeed. 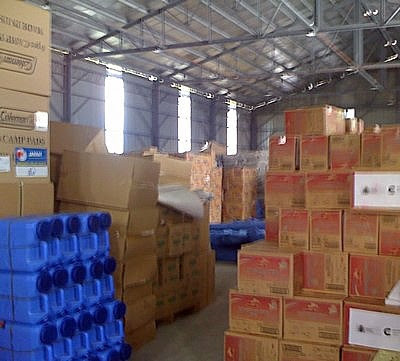 Many privately-run relief efforts wrapped up a week after Ondoy primarily because there were no more goods coming in. Then we all find out, tons are just with the DSWD gathering dust! Maybe Sec. Peter Favila should train his guns on DSWD for hoarding all those relief goods! For what kaya? For next year's elections? Does the gov't intend to give out the rest of these goods when their candidates are campaigning? We can't help thinking this way! Even DSWD Sec. Esperanza Cabral's subsequent explanation on the issue makes no sense. If the agency needed volunteers, all she had to do was shout out over the radio, TV, through the DSWD web site, and other bloggers! It's scary that there are just so many unthinking and inefficient people now in government service! People are dying, or getting sick, and running out of food in the typhoon-stricken areas, or in the evacuation centers, and all that we were treated to were immensely huge photos of Dr. Cabral (and presidentiable Gibo Teodoro) handing out a pittance of relief goods. Teka Lolah, tatakbo ka bang Senador? Even after Ella's exposé btw, things have little changed at the DSWD. Political columnist/blogger Manolo Quezon and some of his friends went to check on the warehouse, the account of which is in Update 3 of Bury me in this dress. Meanwhile, I told my mom about the issue of the DSWD warehouse and she got pissed about it. You see my mom was a social worker back when DSWD was still called Social Welfare Administration. She loved her work so much, going to the poor communities in Tondo, for instance, that she actually turned down a job offer to become the secretary of then SWA administrator Pacita Madrigal Warns. This was the time when Ramon Magsaysay was Philippine president. Back then, she said, SWA staff were extremely efficient, honest, and dedicated to their work. But things may have turned under the time of the Marcoses. My mom told me for instance how one regional SWA official, a former colleague, approached her asking if she wanted some instant milk powder. (This was when my mom was already married to my Dad and had retired from SWA.) She asked how the SWA official came to have so much milk powder in her possession, the officer said, it was bec. of her work at the SWA. "E kasi Social Welfare ako di ba?" was how my mom quoted her ex-colleague. Instead of giving the milk powder, donated most probably by foreign governments, to poor and needy communities, this SWA official was handing them out to friends and family! Ang kapal! Okay, I'm not saying that all the DSWD staff are like this ex-SWA regional officer, but I would suppose everyone will take their cue from their respective bosses. If they see their DSWD bosses just sitting in their airconditioned offices and nagpapa-ganda/nagpapa-picture lang, or filching from their stocks of donated goods, they too will follow. Monkey see, monkey do. Ella didn't claim naman that the relief goods in DSWD are "rotting" there as alleged in some TV reports, or being pilfered by the agency staff, so all I'm saying is, the systems and procedures are definitely not efficient at that agency. There is no organization in the way the relief goods are being handled, repacked, and distributed. What are the DSWD employees doing about this? Now, if the agency is shorthanded, all it has to do is ask for volunteers because I'm sure many people would like to help...unless its officials really don't want the public to know what exactly is going on in those DSWD warehouses.